Have you ever been so high you thought you could touch the sky? Hey now, I’m talking mountain climbing…If you’ve ever climbed a 14er (a mountain summit that is at 14,000 feet above sea level or higher) you understand the euphoric moment when you reach the top. It’s like sitting on top of the world. 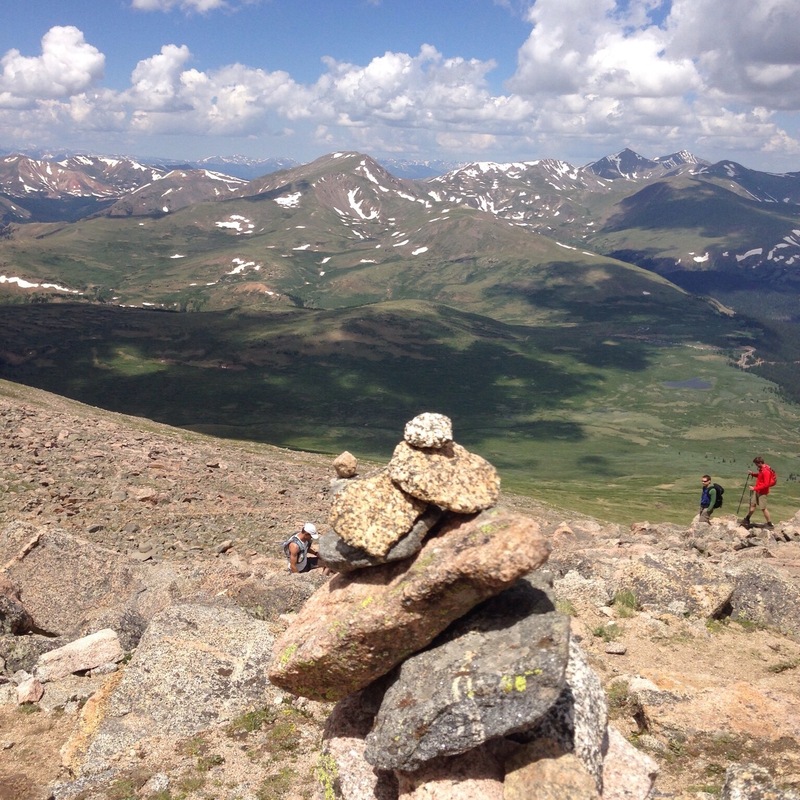 Colorado is home to 58 fourteeners that bring droves of hikers and outdoor enthusiast to the trails. The Humbleweeds have crossed off yet another item on the bucket list. It all started with a drive to Mt Evans, located near Idaho Springs, CO at an elevation of 14,271. Known as the highest paved road in North America, the Mt. Evans Scenic Byway winds to the top of the summit passing breathtakingly beautiful Echo and Summit Lakes. With snow still visible and the hillside blanketed with summer wild flowers, curious white mountain goats and bighorn sheep looked on as thousands of tourists make their way to the top of the sky-scraping peak. Looking out at the endless sea of mountain tops, feeling a sense of peace and wonder, one truly gets lost in the moment. As John Muir once said, “the mountains are calling and I must go;” so we began planning our next 14er outing, this time on foot. Being novice climbers and maybe a little more “aged” than most on the trail, the Humbleweeds set out for Mt. Bierstadt, standing at 14,060 ft above sea level, just outside the town of Georgetown, CO. The parking lot was situated around 11,600 feet and from there the hike was a sharp 2,392 ft climb to the rocky summit. On July 4, starting at 7:00 a.m., we joined hundreds of other hikers making their way to the top. The round trip was a seven mile hike, but certainly not for the faint of heart. While passing through willow marshes and wadding across the rushing Scott Gomer Creek, it took almost 4 hours to reach Bierstadt’s western slope. The rocky trail made several switchbacks while progressing up the mountain. On the talus upper regions of the mountain, the route was no longer a recognizable path but a series of cairns, marking the way to the summit. The last 300 yards was certainly the most difficult while crossing the scree (broken rock fragments) while maneuvering the jagged boulders to the peak. As the air became thinner, it was evident the altitude affected our attitude, that’s right, the euphoria set in! We made it! Another Humbleweeds first…a real emotional high! Once at the top, we claimed a spot on the peak to sit and bask in the glory of our accomplishment. We shared the peak with others who also made the successful trek to the top. Some even celebrated with a festive “keg stand” at 14,060 ft, oh yes…(see photo.) We were amazed to see so many well behaved dogs made the trip with their human companions. From the peak, we could see Mt. Evans, the mountain that inspired us to make the journey just a week before. One hiker told us he’d been hiking on Mt. Bierstadt more than twenty years and had never seen the weather on the mountain more perfect; certainly a a perfect way to spend July 4th in America. The hike to Mt. Bierstadt, looking back at our progress. Meet Cairn, our tour guide atop Mt. Bierstadt. Celebrations (keg stand top left), reflection, and rest! The decent back to reality. Mt. Bierstadt in the distance.